Since 2001 Ibsen Stage Company has staged a total of twelve productions of eight plays on the London fringe, six in original translations. Five of these have been Ibsen dramas. The year 2006 was the 100th anniversary of the death of the Norwegian playwright Henrik Ibsen and Dale Teater Kompani is delighted that the Royal Norwegian Embassy chose its production of Little Eyolf for the official launch of Ibsen Year in the UK at the Riverside Studios on 24 January 2006. 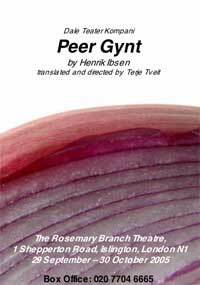 In October Dale Teater Kompani began the preparations for Ibsen Year by producing a new translation and adaptation of Peer Gynt at the Rosemary Branch Theatre as a warm-up to the year. The production also ran at the Hackney Empire Studio Theatre between 30 January and 24 February 2007. This was followed by a production of one of Ibsen’s least performed plays, Little Eyolf, together with an Ibsen Seminar and an exhibition of paintings at the Riverside Studios in January and February 2006. 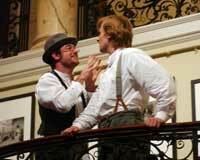 These events formed the start of Ibsen Year 2006 in London by creating a focused interest in the centenary. The celebrations included the launch of the year by Eve Best and a presentation of the Ibsen Centennial Award to Vanessa Redgrave by Lars Roar Langslet from the National Ibsen Committee in Oslo. Little Eyolf had previewed at the Riverside Studios from 17 January, immediately after the Ibsen Year opening weekend celebrations in Oslo. Dale Teater Kompani’s Little Eyolf was previously performed at the Rosemary Branch Theatre in 2003 and was newly adapted for the Riverside Studios. After leaving the Riverside Studios, the production was invited to Norway in March for guest performances at Teatret Vårt in Molde and at the Ålesund Festival - see the Norwegian article in Romsdals Budstikke. Since 2001 Dale has staged a total of ten productions of eight Scandinavian plays on the London fringe. Five of these were Ibsen dramas, A Doll’s House, Pillars of Society, Rosmersholm, Peer Gynt and Little Eyolf, all in original translations and adaptations by Terje Tveit. A Doll’s House was performed at the Rosemary Branch Theatre, Islington, the New End Theatre, Hampstead and also at the The National Theatre in Oslo as part of the 2004 Ibsen Festival. As a company used to working within very tight financial constraints and making the most of limited resources, Dale TK is driven purely by the dedication of a small group of actors and by a passion to communicate Ibsen’s drama in original ways. Terje Tveit’s unconventional stagings and new translations have excited a great deal of interest, particularly from the late Inga-Stina Ewbank and other leading academics, whose encouragement has been an inspiration to the company. Equally, the response and enthusiasm received from school and college groups, together with those unfamiliar with the work of Ibsen, has also been most gratifying. Dale Teater Kompani is also grateful for the support given by the Royal Norwegian Embassy, London, the Norwegian British Chamber of Commerce and particularly by the Rosemary Branch Theatre, Islington, whose support has been unstinting for many years. 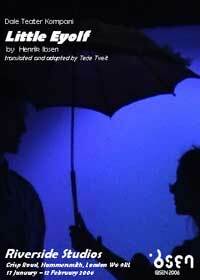 With or without a centenary, Ibsen is regularly performed in the UK. The centenary year will, nevertheless, represent a unique opportunity to highlight how Ibsen as a dramatist has been re-invented on the stage again and again. Ibsen’s universal ideas and timeless psychology have stood the test of time and are as relevant today as they were during his life.